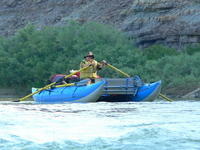 In the Summer of 2006, I participated in two multi-day river trips. 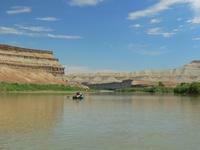 The first, from July 19 to 24, was through Desolation and Gray Canyons of the Green River in Utah. 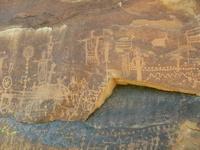 These are wilderness canyons ending just north of the town of Green River. 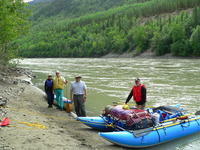 The second trip was down the Lower Stikine River in northern British Columbia. 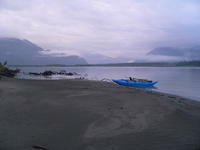 We launched from Telegraph Creek on August 4 and arrived in Wrangell, Alaska on August 12. 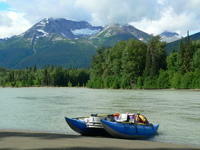 On August 14, we returned to our cars at Telegraph Creek by jet boat. The trips presented a strong contrast. 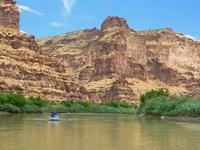 The Green River flows through desert redrock country with low vegetation, very silty water, and a dry, hot climate. The temperatures were near 100 F during our trip, which was made bearable by the option of swimming at nearly any time. 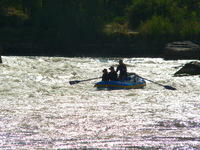 The river was running 1800 to 2400 cfs and has rapids of of about class 3 at that level. The Stikine is a huge river running through a wilderness of rainforest, mountains, and glaciers as it penetrates the BC/Alaska coast range, a part of the world from which the ice age has not fully retreated. It has little in the way of rapids, but with a current that runs at 6+ mph for almost the whole distance and a flow of 80,000 to 100,000 cfs near the mouth when we were there, it is a big, pushy river whose whirlpools and crosscurrents require serious attention. Capsizes by canoes do happen, especially in the higher water such as existed the week or two before our trip when the flow was almost 200,000 cfs - as big as the Columbia at the time. The weather varied from near room temperature and partially clear to cool and rainy with the latter prevalent near the coast. The usual bane of northern trips, bugs, were mostly absent. In fact, there were nearly as many on the Green. The participants in the Desolation Canyon trip were Kerry Luttrell, Ron Thomas, Janet Brook, Pete, Jen, and Phil Whiteis, and myself (Craig Walker). All are from Socorro, NM, except Kerry who is from Nanaimo, BC. For the Stikine, we had Kerry, his wife Sharon, and Ron Bollans from Nanaimo plus myself. Ron Thomas was supposed to go, but was unable to because of a flooding situation at his house near Socorro. The rains had come with a vengence after nearly no precipitation since October. 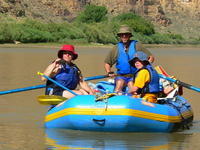 On the Green river, we used rafts - one self-bailer and two catarafts. 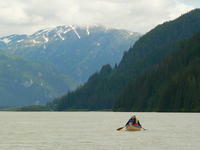 On the Stikine, Ron and I used the larger cataraft while the Luttrells used a canoe. For some of us, these trips were the first experience rowing a raft, although we all had experience with canoes and kayaks in whitewater and with long wilderness trips. These trips involved considerable time on associated logistics. There were 2 days of driving before launching on the Green (plus Kerry flying from Canada). Then my car got left in Salt Lake City for a few days while I returned to work. After flying back to Salt Lake, it was a 2 day drive to my sister's place near Calgary and most of 3 days to get from there to Telegraph Creek, including meeting the others and shopping for the trip in Prince George. Afterwards, I took 10 days to get home, including a day layover at the Luttrell's cabin at Deka Lake and an overnight canoe at Waterton Lakes with my sister. 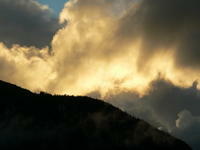 There are a minimum of about 5 days of driving to get between Socorro and Telegraph Creek, which is close to the Yukon. Below is a selection of photos covering both trips. All were taken with my Panasonic FZ20. Click on the image for a screen size version. The "full size" version is larger (not available in web versions). Ron and Janet in Ron's Infinicat on the river not far from the launch area at Sand Wash.
On the river in Desolation Canyon. The Whiteis family on the river. Ron and Janet running Steer Ridge Rapid (I think). Kerry preparing to run Wire Fence Rapid with the Jaguarundi. I would normally have been riding the raft when he was rowing, but for this rapid I was on shore trying for some photos. 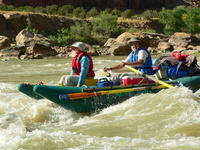 The Whiteis's in Three Fords Rapid. Surviving the heat. On this occasion, the swimmers, with occasional intervention from the rowers, were playing catch with a ball someone found. 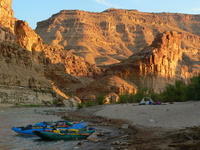 Camp at the base of Rattlesnake Rapid. Ready to depart from Telegraph Creek, below the Stikine Riversong. Left to right are Sharon and Kerry Luttrell, myself and Ron Bollans. The raft was not needed for whitewater on this trip, but it is a comfortable and safe way to do this river. There is no worry about a capsize or swamping. In fact, we generally went straight for the biggest waves we could find. With the strong current, the extra speed of the canoe doesn't really shorten the trip much. 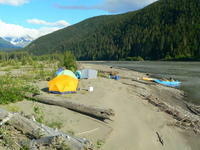 Stikine Riversong provided a campsite, restaurant meals, parking for our vehicles, and the jet boat haulback from Wrangell. They have rooms on site, but were full. 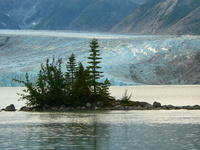 A typical scene along the river - water, forest, mountains, and glaciers (a small one in this case). Our camp a couple of km below Skud Portage. 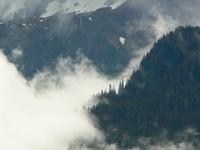 Mountains and glaciers reaching into the clouds above the Stikine. The Great Glacier and Outflow Lake. We spent a layover day at the camp near the Great Glacier and walked to the lake twice. We were at a forestry campground complete with picnic tables and fire rings. The skyline near the Great Glacier late in the day. 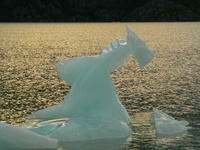 A small iceberg in the Outflow Lake at the Great Glacier. 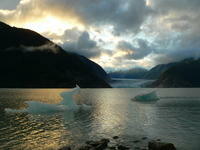 The Great Glacier and Outflow Lake late in the day. The cataraft at our last camp on the river. Kerry and Sharon working through the mud flats of the delta. 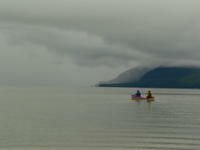 Crossing the delta and some ocean to Wrangell in calm, but cloudy conditions. The first portion of the crossing mainly involved trying to find deep enough water through the mud flats. Several times, we had to push the raft. Remarkably, it did not rain much on us despite what was going on not far away. For the final part of the crossing, the tidal currents dominated and we, knowingly because of the usable weather, were crossing on the wrong, incoming, tide. With an outgoing tide, we probably would have had good current all the way to the harbor. 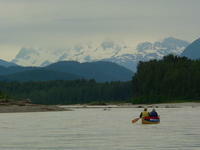 As it was, we had to wait for a while for the currents to slow to get around the top of Wrangell Island. 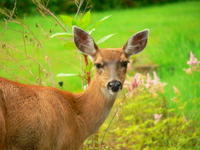 A deer at the Grand View B&B, where we stayed about 2 miles south of Wrangell. We can certainly recommend that facility for lodging. On the way home, we stopped at the Luttrell's place at Deka lake. 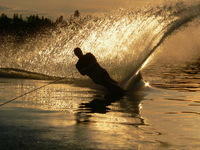 This photo is of Kerry's son-in-law, Ryan, water skiing. I include it here because I like the photo.